Sturm, Ruger & Co., one of the nation's leading gun companies, reported fourth-quarter earnings and sales Wednesday that blew past analysts' expectations. The Southport, Conn.-based company said it earned $1 per share on sales of $141.8 million in the final three months of 2012. Analysts were looking for earnings of 82 cents per share and sales of $122 million. The results do not fully reflect the recent spike in gun sales, most of which occurred have occurred in 2013. Shares of Sturm, Ruger (RGR) were up nearly 3% in premarket trading. "Demand for our products outpaced the growth in overall industry demand," Sturm, Ruger CEO Michael Fifer said in a statement, pointing to the number of federal background checks - a barometer of gun sales - that were made this year. Fifer will discuss the company's results in a conference call with analysts Thursday morning. For the full year, net income increased 77% to $491.8 million, or $3.60 per share. Gun retailers have struggled to keep up with demand for firearms in the months following a mass shooting in Newtown, Conn. The shooting, which left 20 children and six adults dead, reignited the debate over U.S. gun laws. Sales had already been on the rise since President Obama's reelection in November. Public safety advocates say its time to rethink the nation's gun laws as mass shootings have become increasingly common. Last month, President Barack Obama proposed background checks on all gun sales, as well as bans on military-style assault weapons and high-capacity magazines. That same week, New York Gov. Andrew Cuomo signed a gun control package into law that fortifies the state's existing assault weapons ban, limits the number of bullets allowed in magazines and strengthens rules governing the mentally ill. The renewed focus on gun control set off a frenzy of gun buying by Americans who fear they may be denied their constitutional right to bear arms. "We've had a massive build up," said Brian Rafn, director of research at Morgan Dempsey Capital Management, a long-term shareholder in Sturm, Ruger. "Guys are hauling out shopping carts full of ordnance." In a sign of the surge in demand, Wal-Mart, one of the nation's leading gun sellers, told industry analysts this month that it was having troubled obtaining certain firearms, though it would not specify which ones. Gun shop owners told CNNMoney that semiautomatic rifles and high-capacity magazines are flying off shelves across the country, since many people are worried that their right to buy assault weapons could be curtailed with gun control legislation. 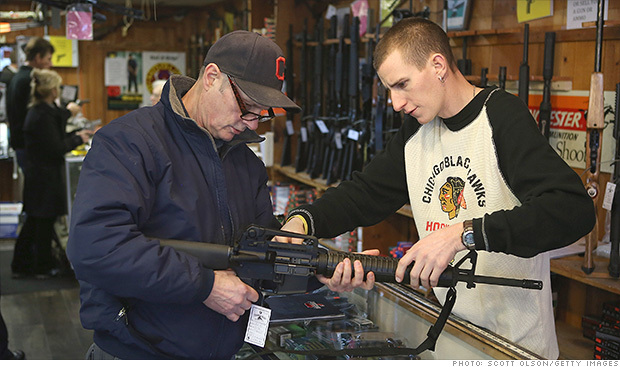 Gun industry experts say they are buying up guns while they have the chance. But Rafn said the increase in sales for the civilian gun industry will be difficult to sustain over the long term. "With the economy moderately improving and some of the rhetoric dying down, it will be very difficult for the civilian gun market to sustain 20 million in sales for the next four or five years," he said.